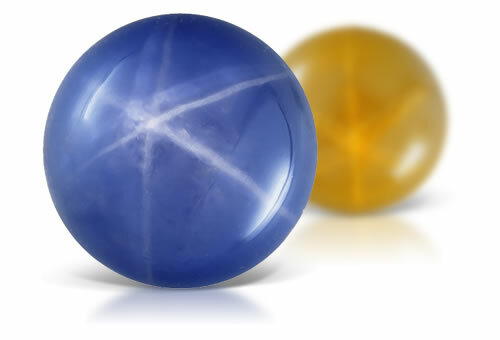 Synthetic star sapphire exhibits the optical phenomenon called asterism, a star-like pattern created on the surface of a gemstone when light encounters parallel fibrous, or needle-like, inclusions within its crystal structure. Light that strikes the inclusions within the gem reflects off of the inclusions, creating a narrow band of light. When two or more intersecting bands appear, a star pattern is formed. The flame fusion process for creating gems, also called the Verneuil process, is the most affordable and common synthesis method for producing corundum (ruby and sapphire) and spinel. Powdered chemicals (the building blocks of the gem) are dropped through a high-temperature flame. The molten powder repeatedly falls from the flame onto a rotating pedestal, creating a synthetic crystal, called a boule, which can later be faceted into a gemstone. Synthetic gems have the same chemical, optical, and physical properties of their natural counterparts, but are a more cost-effective alternative to a natural gem. Stones typically have flat bases and are well cut calibrated cabochons. Stones will have brighter colors than natural sapphire. Flame fusion stones might display curved growth and a unusually display a centered and well defined 6-rayed star. The curved growth is especially visible on the flat base of the stone. The stones might have gas bubbles and minute rutile needles that make up the star will confined to the surface of the stones.